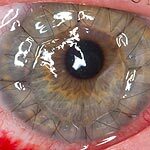 A new hydrogel film able to help the cornea heal itself could offer an alternative to corneal transplant surgery. The cornea relies on special cells called corneal endothelial cells to keep the cornea moist by pumping water through it. Once these cells become damaged, such as by trauma or aging, they do not function as well, and the cornea will become cloudy. And, to complicate the process, the corneal endothelial cells cannot repair themselves—thus people turn to cornea transplants. A team from the University of Melbourne decided to offer an alternative to transplants by growing cornea cells in a hydrogel film in the lab. That film was then implanted on the inner surface of the patient’s cornea via a small incision, where the new cells restore the cornea’s ability to move water and remain transparent. The film will biodegrade within about two months, with no detrimental effects. And, according to team member Berkay Ozcelik, “Since it's [the patient’s] own cells we are using, there is no risk of disease transmission or tissue rejection."